As a Richmond native, I’ve lived and played all over this amazing city and I love the outdoor lifestyle Richmond has to offer. Each neighborhood has its own special charm, whether you want to paddle the river, bike an extensive trail system or simply picnic at historic Maymont. My family of 5 currently calls Midlothian home where I’ve established deep ties with community involvement. Most recently, serving as president for the non-profit SWIMChesterfield which established high school swimming in Chesterfield County. I have built an extensive network of contacts and I understand the ever-changing local housing community. With a degree in Horticulture & Landscape Design and as your Licensed Virginia REALTOR® I have the ability to assess and stage your home inside AND out. 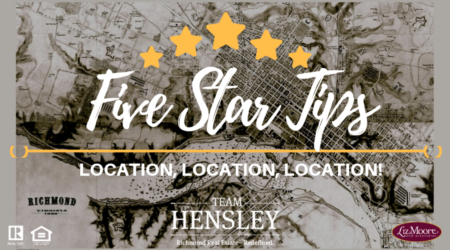 In 2018 I was honored to be asked to join Team Hensley, Liz Moore's RVA top producing real estate team and my goal is to work hard so that you don’t have to. Give me a call today and let’s start strategizing your home’s UNIQUE sales plan and then….let’s find you the next perfect spot to call home.